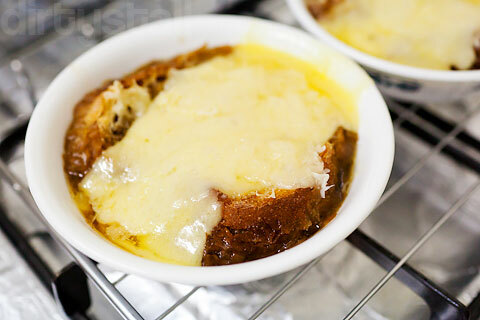 A while back I got to try out some French onion soup that my friend cooked for a group of us so much later on when I had some spare time, I decided to give the dish a go as well. The recipe I that decided to use was adapted from Thomas Keller’s Bouchon. 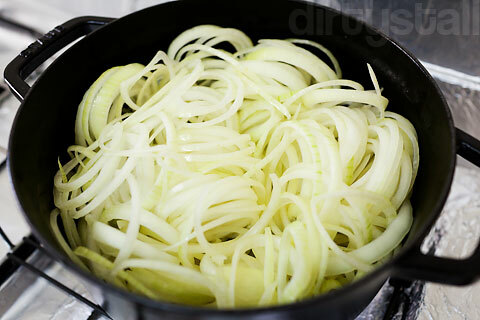 Obviously the main ingredient was going to be onions so I started with a bunch of them. 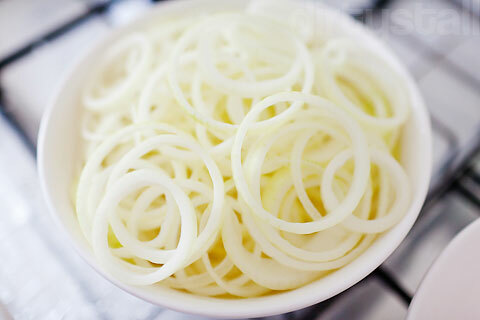 The next series of photos charts the condition of the sliced onions over the course of many many hours. 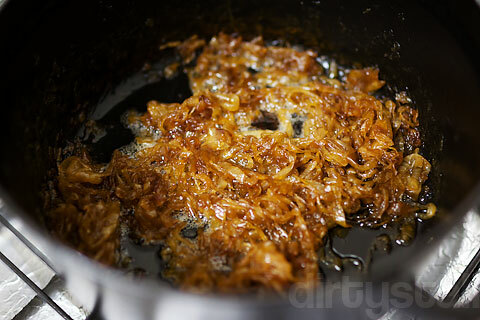 Ending in a small dark brown mass of richly caramelised onion! Add a couple of litres of beef stock. Fresh thyme, bay leaves and black peppercorns round up the herbs and spices to go into the stock. Simmer away, until the soup is much reduced. 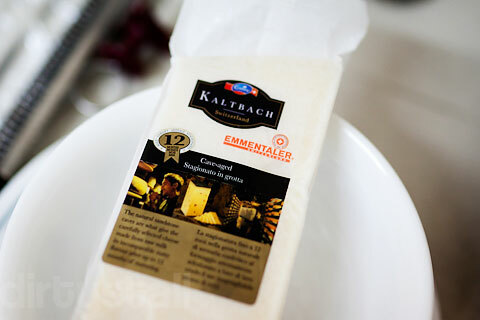 Cheese to be used, I used Emmentaler in this case but I think I would still prefer to use Gruyere in future. 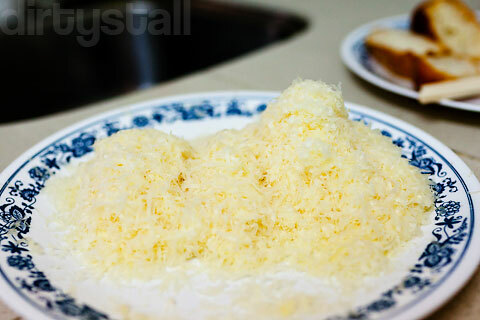 Grated the cheese but also had slices of it. 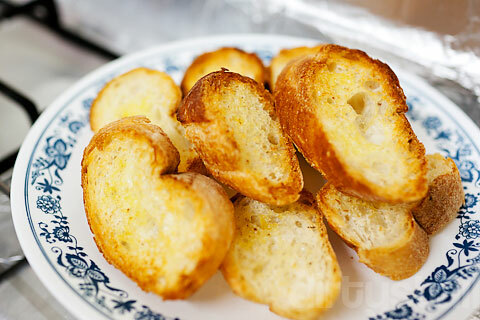 Toasted the slices of baguette to be used. 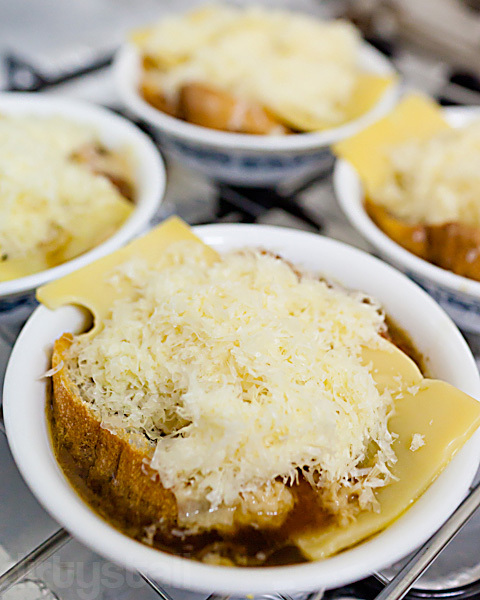 Float 2 pieces of baguette in each bowl of soup, the layer with slices of cheese and finally top with the grated cheese. I was supposed to cover everything so that the bread can’t really be seen but I ran out of cheese. Using a blowtorch is the best way to brown the cheese but the alternative method is to just put them into the oven like what I did. And that was my French onion soup! 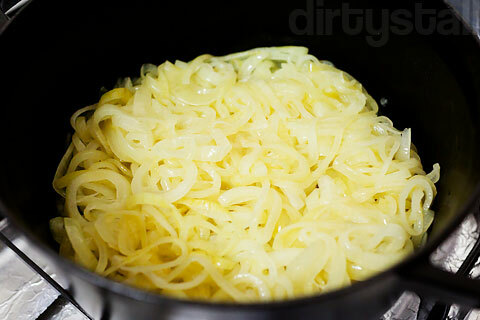 11 Responses to "Soupe à l’oignon"
how long did you take to caramelize the onions? looks yummy! Have been waiting for your post! glad to see you posting again! 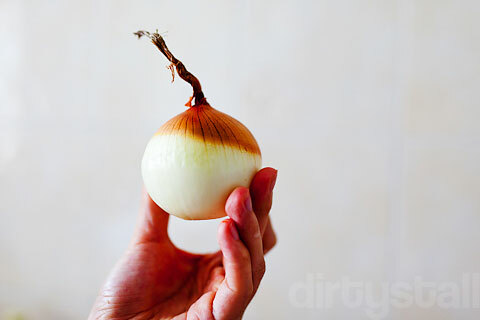 I love caramelised onion! Looks good! 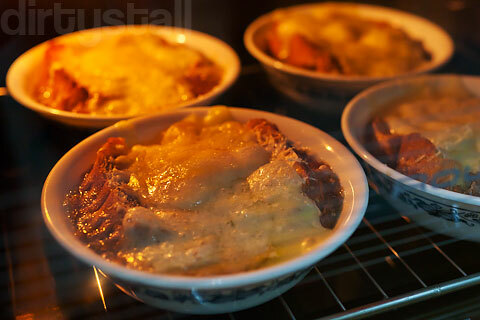 I was searching on French Onion Soup recipe recently. Yours went the extra mile with the cheese and toast on top! 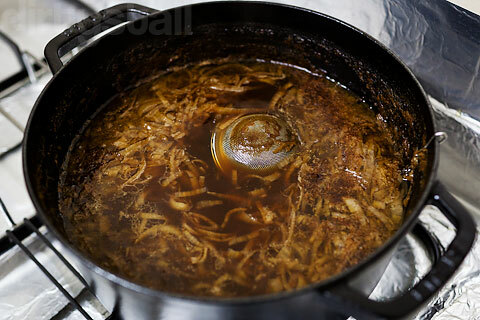 French onion soup is great but I feel a very important component is also the quality of the beef stock. You know, it takes lesser time if you use a large open pan instead of a pot. 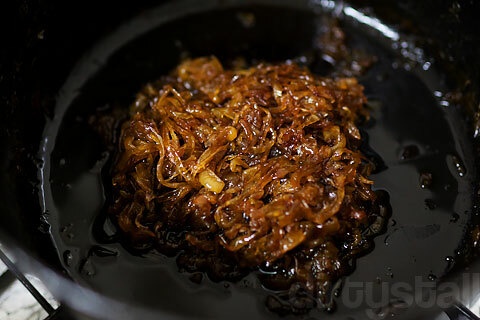 Onions only start caramelising when their moisture has evaporated. 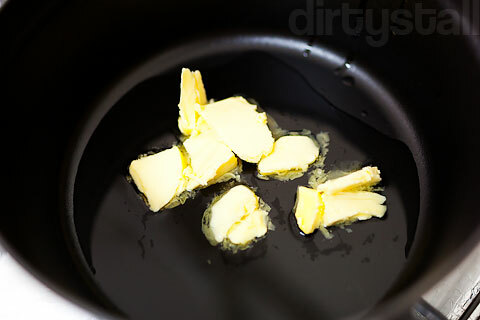 A wider pan speeds up caramelisation. 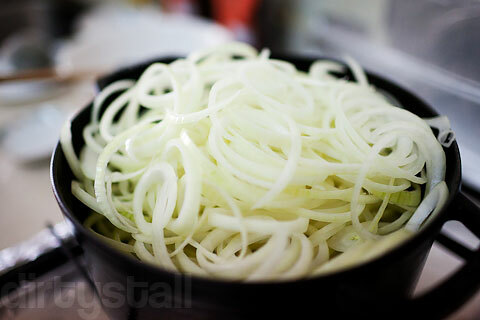 Also, red onions are better because they have less moisture and are more intense when caramelised. 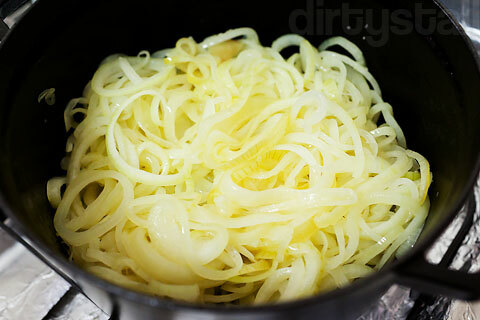 Yellow onions take forever. And that is one gigantic pot. You feeding army ah?Lol. Hmm that’s a good idea! I used a pot because I thought since I’m going to add the stock to it so I just do everything in 1 pot. But next time I’ll try using a large pan and those red onions you recommended. And that’s my standard soup/stew/braise pot hahaha, holds about 3-4 quarts. lol ok. WordPress was being irritating just now. I couldn’t comment! 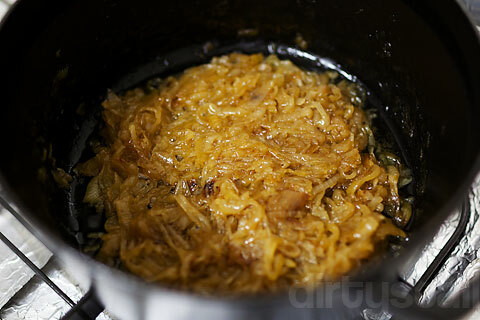 Anyway, I was going to say you took 4 hours just to caramelize the onions! I could slurp up the soup in less than 4 min haha. 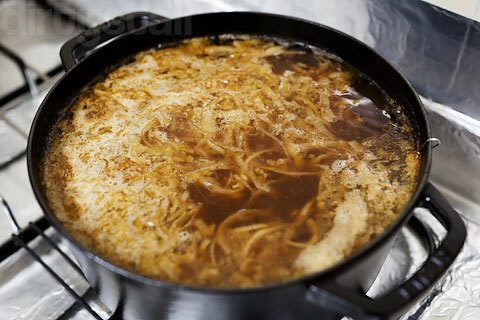 I had a bad experience with French onion soup before (can’t remember where), so I tend not to order it in restaurants. Your soup looks delicious. Maybe I should give this a 2nd chance. 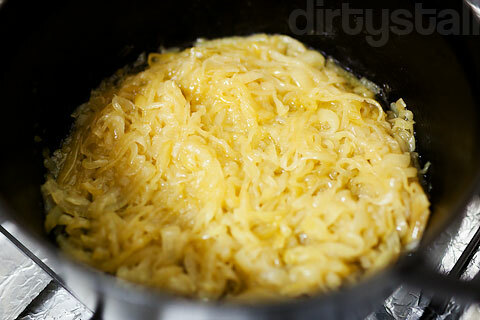 I mean ordering French onion soup in restaurants, not cooking it myself hahaha. 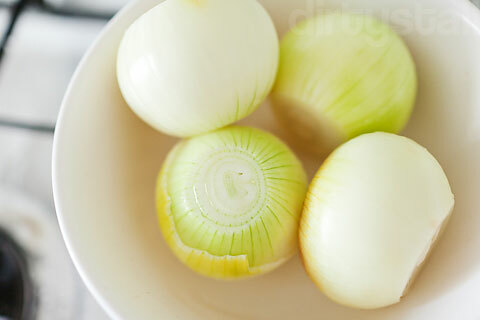 But making it myself, I’ve come realise everything is really important, from the onions to the beef stock to even the type and quality of cheese used because you can really taste it all in the soup. Hehe do give it a try! 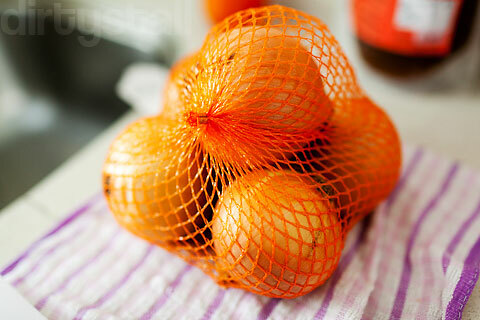 It is delicious and worth the effort, but really requires a lot of free time. 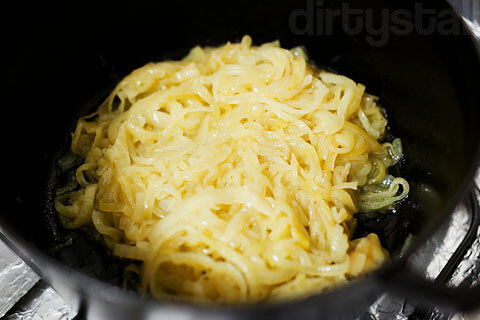 If you submitted your Soupe à l’oignon photos to http://www.foodporn.net , I’ll bet they will make you on the home page.